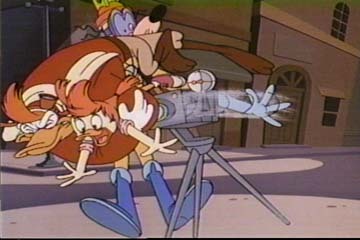 Ack! Could someone remind me who donated me these screenshots, please?! 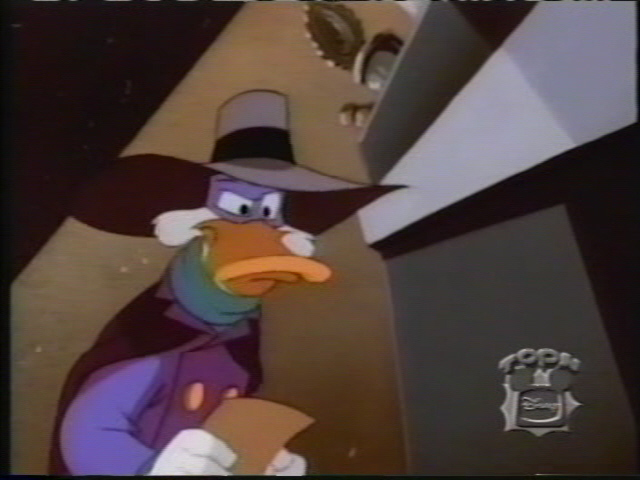 Yeah, whatever - Darkwing looking casually bored. OMG WHAT?! 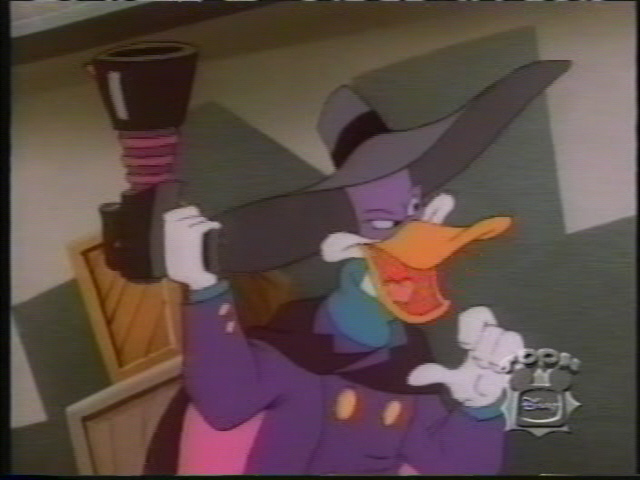 - Darkwing is totally freaking out! Um... DW... behind you?! - Totally oblivious to the fact that there's a giant axe swinging behind him! 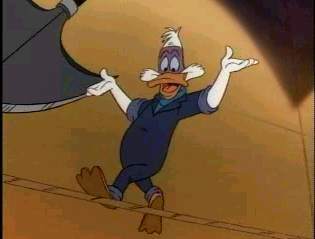 But hey, check out those tightrope walking skills! 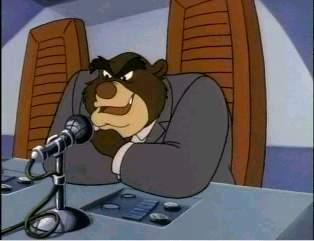 Agent Gryz on the mike - Everyone's favorite (not) grouchy bear SHUSH agent, Gryzlikoff, sitting behind a microphone and console. And you know he's not singing karaoke. 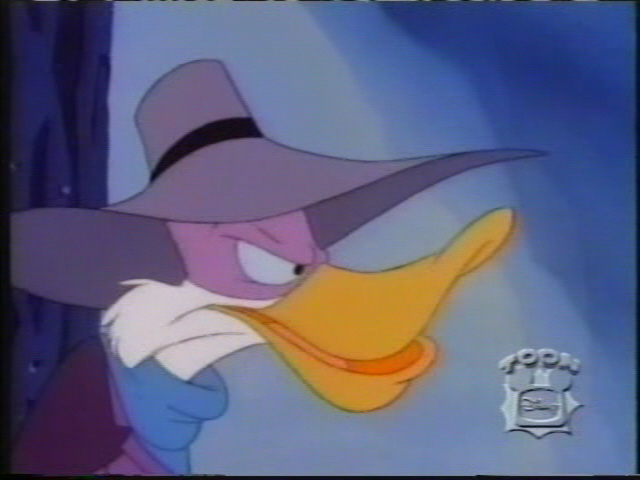 Dramatic Closeup: The Hero - A closeup of Darkwing lurking in the shadows. Wow, he sure looks serious. 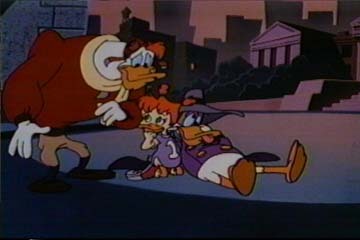 Oopsie daisy - Darkwing takes a fall... but he doesn't take it well. Oh, well... even heroes have slip-ups now and then. 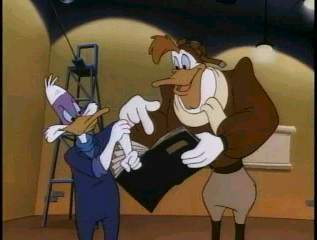 Dramatic Closeup: The Sidekick - a closeup of Launchpad, who's right under DW (see the first screenshot). Oh no! Not him again! 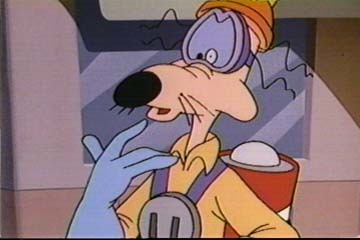 - Yup, Megavolt's been caught red-handed, and he knows it. 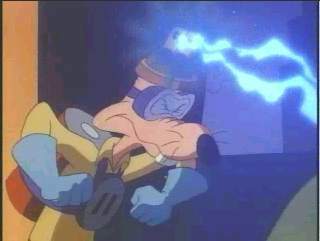 Watch out, Sparky! KRRRRZZZAP! 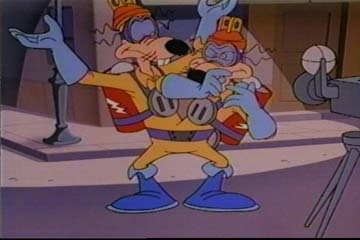 - ... and Megavolt reacts from the above. When in doubt, roast it to a blackened crisp! 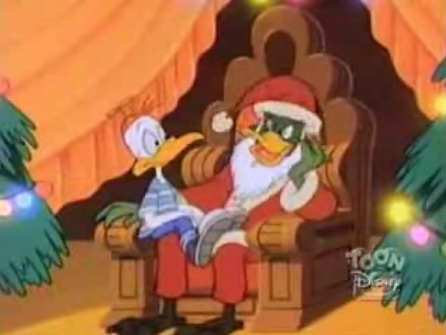 Reggie Claus - Bushroot playing a rather skinny and green Santa at the Saint Canard shopping mall. Donated by nega-mexican fan. 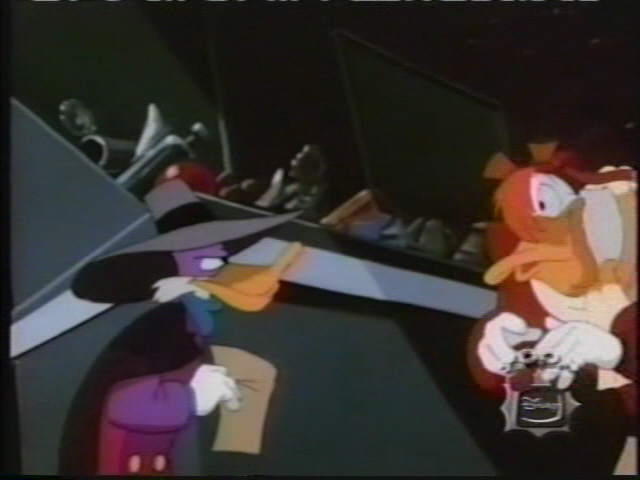 Docking her allowance - Darkwing scolds Gosalyn, who's too happy and relieved to care. 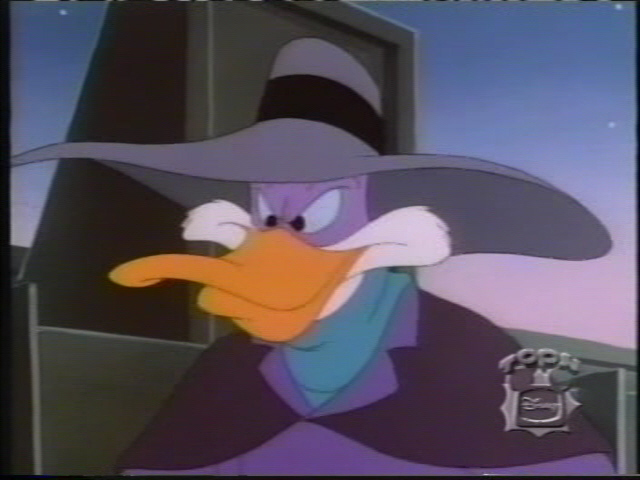 Gos looks somewhat off-model in this frame, but Darkwing looks great. I love that expression. Donated by Kilthalia. 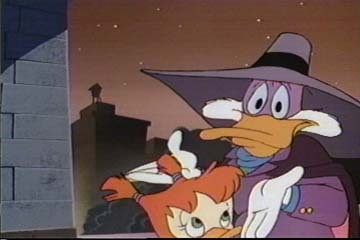 Shrugging - Darkwing doesn't know what Gosalyn's so happy about, but hey, he's okay with it. A classic expression and pose. Donated by Kilthalia. 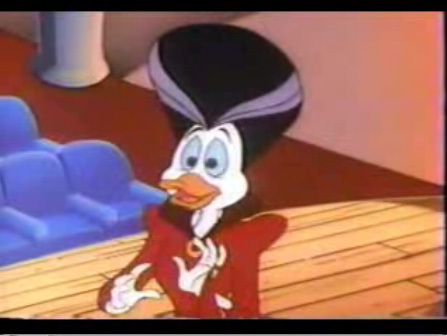 Gosalyn-Ball - Launchpad looks like a football player with Gosalyn under his arm like that. 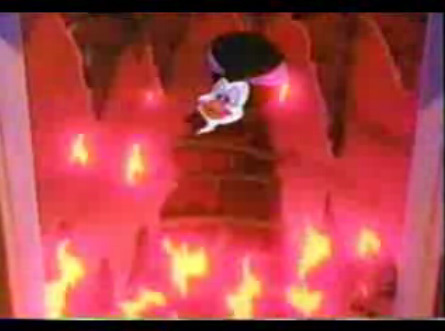 Look at Gosalyn's freaked-out expression! I bet now she knows how a football feels! Donated by Kilthalia. 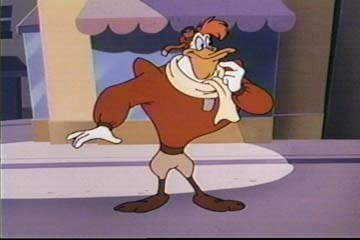 Launchpad full-body shot - A good reference pic for Launchpad. He doesn't look particularly sure how to make himself useful. Donated by Kilthalia. 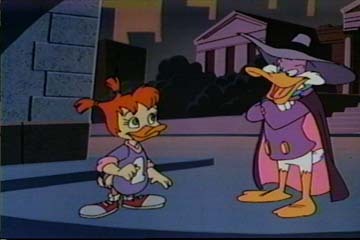 So obnoxious... - Here's Gos with LP, giving the newly recovered Darkwing a once-over. 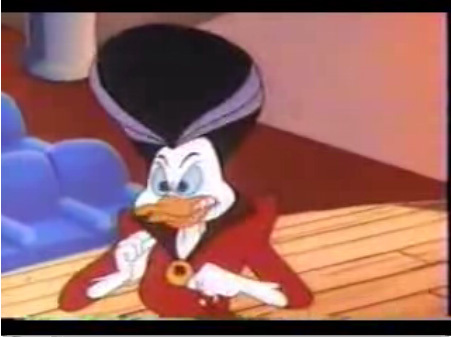 I need to master how to draw duck beaks in the "O" shape like that... Donated by Kilthalia. Woah! 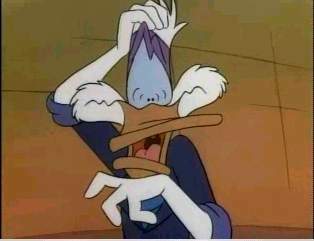 - Megavolt is freaked out by something - or should I say, someone - off-screen. Donated by Kilthalia. Well, that's just peachy! 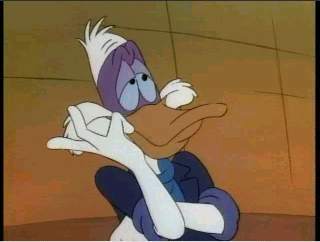 - How many cartoon characters say that these days? Not many, that's for sure. 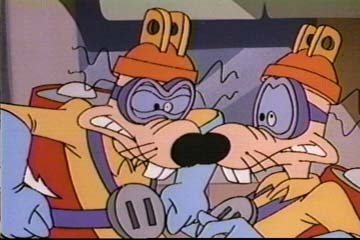 Here's Megavolt's evil side and good side, split apart... sort of. Donated by Kilthalia. 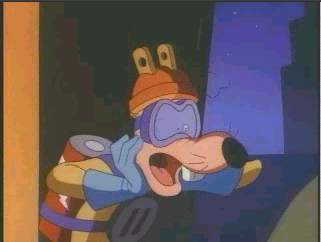 Whatever, man - That looks like what Evil Megavolt looks like he's saying to Good Megavolt in this frame. You'd think they switched places with their expressions. Donated by Kilthalia. 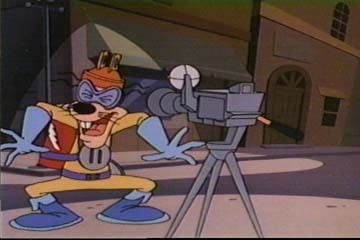 Mid-wild take - This frame was taken in the middle of Megsy's wild take at the Tron-Splitter being aimed at him. Notice his jutting chin starting to form for the resulting wide-mouthed expression. Donated by Kilthalia. Worried family - With DW in one piece again, Gos and LP are worried if he's okay... and if he's back to normal. If you can call the look on his face normal. *snickers* Donated by Kilthalia. 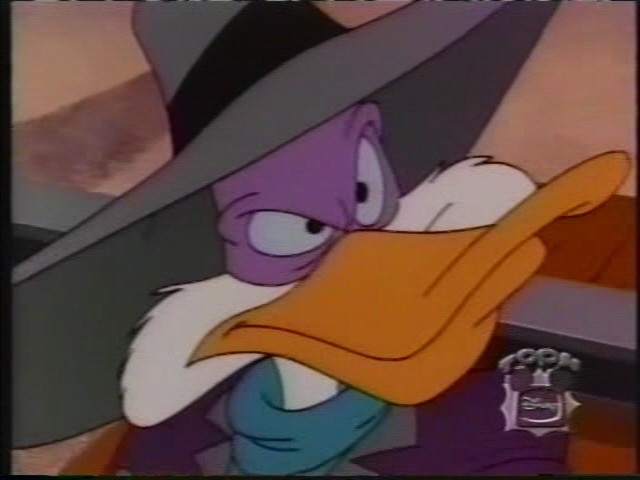 Annoyed - Darkwing looking... well, annoyed. Donated by DWRaptor. 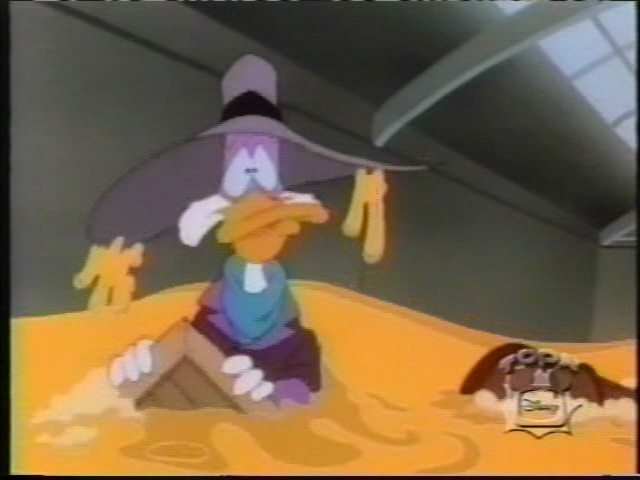 Ewww... - Darkwing is up to his armpits in egg yolk. 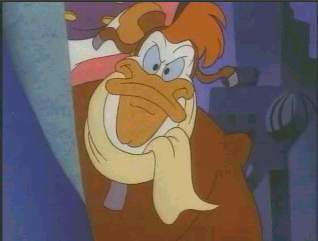 Consider the fact that he's a duck, and you'll begin to comprehend how gross this actually is. Donated by DWRaptor. 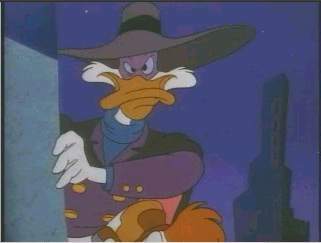 I'LL handle this - Darkwing trying to tell an off-screen Gizmoduck to back off. Donated by DWRaptor. 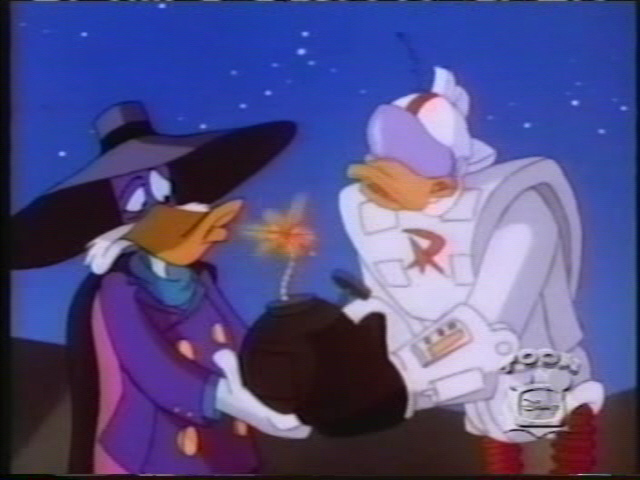 Somebody set us up the bomb - Darkwing and Gizmoduck holding a LIT bomb... uh-oh. Donated by DWRaptor. Gimme that! 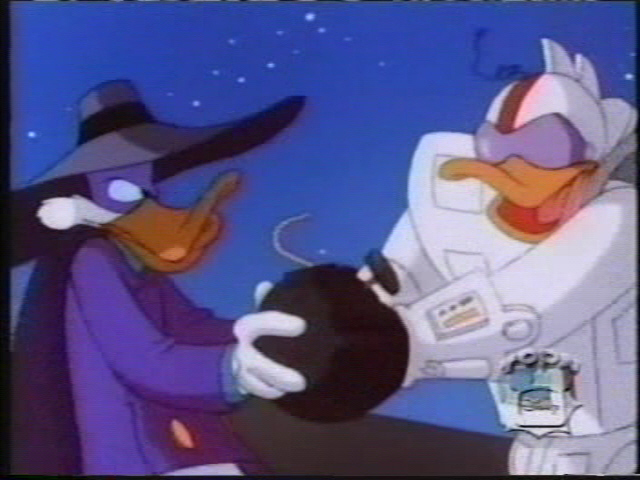 - Darkwing and Gizmoduck fighting over the bomb just moments before, not seeming to care that it could go off any moment. o_o; Donated by DWRaptor. 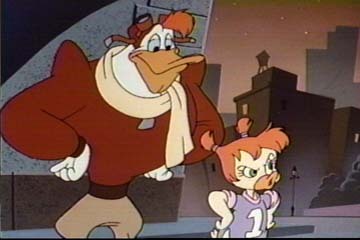 Note the hair - Darkwing shoots an annoyed glare at Launchpad, whose hair is cutely covering half his face. Kinda like Jessica Rabbit... oh no! The mental imagery is disturbing!! Donated by DWRaptor. 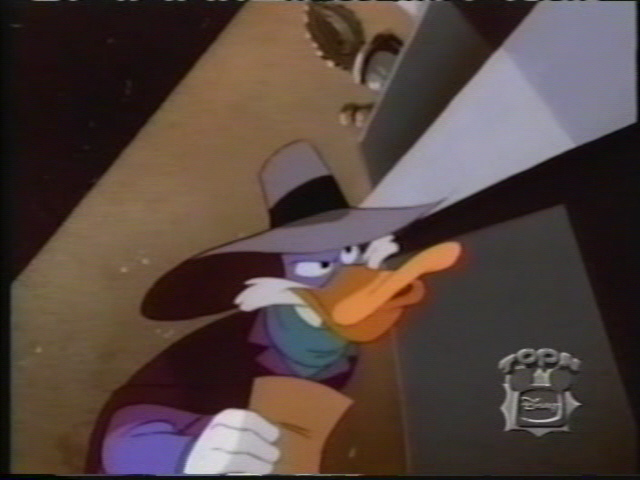 The paper - Darkwing in an alleyway, holding Steekbeak's dry cleaning bill. Donated by DWRaptor. 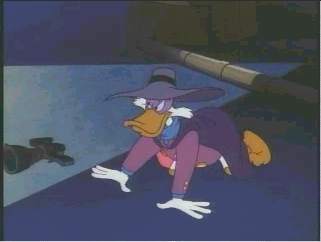 Eww, again - Darkwing, same scene as above, looking as though he just stepped in something. Or that he smells something foul (or F.O.W.L.). Donated by DWRaptor. 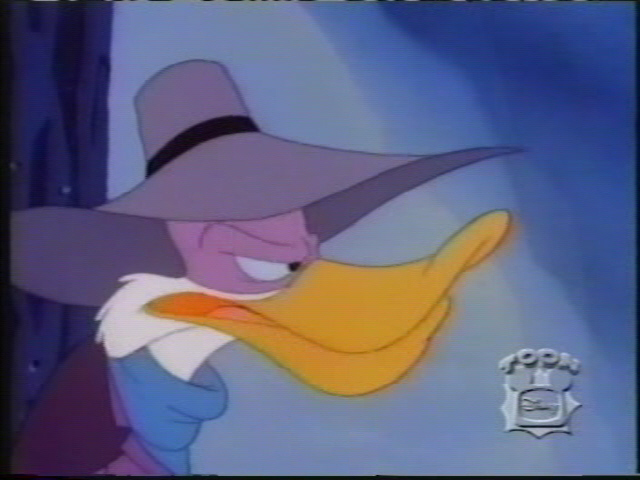 "Oooooh..." - Darkwing again, talking to himself. Donated by DWRaptor. Seriously, now - Same shot as above, only mouth closed, eyes open, and looking dead serious. Donated by DWRaptor. Oh, you dirty rat! 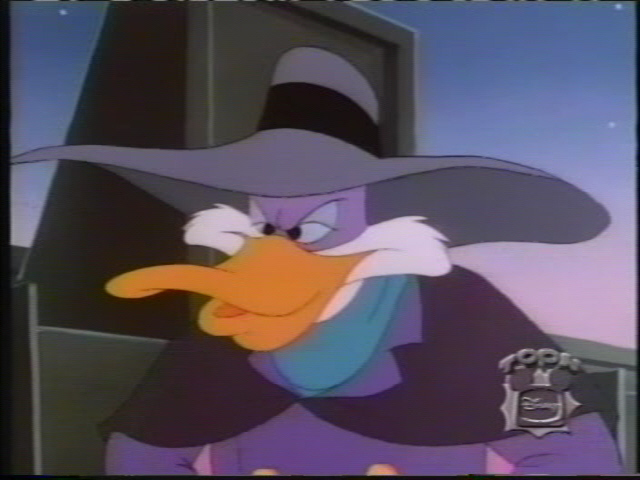 - Darkwing talks out the side of his mouth, kinda like a stereotypical 1920's gangster. ... Okay, not really, but that's what it looks like. Donated by DWRaptor. A nice profile of DW - Same shot as above, only now he's speaking normally, apparently. Okay, okay, I'll stop! X) Donated by DWRaptor. 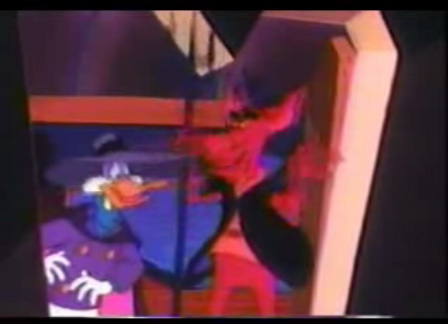 Darkwing and Beelzebub - Surprisingly, this isn't the first time Darkwing has met Beelzy here. The first time was actually in an earlier episode... can you guess which one? Donated by nega-mexican fan. 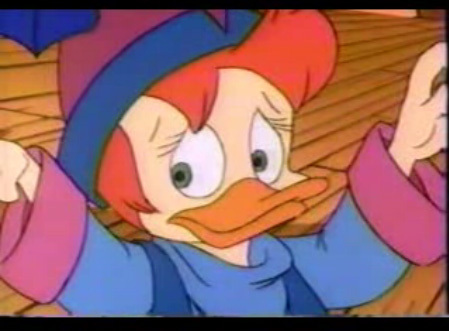 Gosalyn the witch - Can anyone see a DW / Harry Potter crossover starring Gosalyn, or is it just me? Donated by nega-mexican fan. Morgana - Looking shocked. Donated by nega-mexican fan. GRRR - Same shot as above, only a few seconds later. Morgana displays her infamous anger, though she hasn't reached her boiling point YET... Donated by nega-mexican fan. DW dismayed - See why below. Donated by nega-mexican fan. 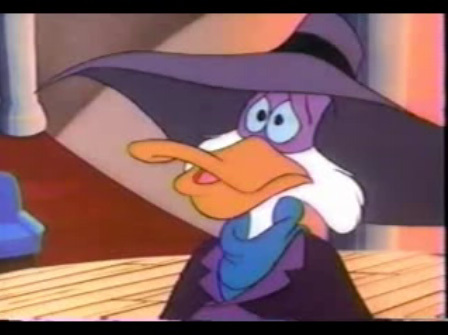 Morgana in trouble - Will Darkwing give up his soul to save his girlfriend...? Donated by nega-mexican fan.